This lovely cottage features a bed nook, loft, dining and living area. The house has a water cooler, refrigerator, toaster oven and coffeemaker for convenience. Relax on the porch and enjoy the scenery! Armadillo house is located near the Tejas Pavilion for access to the Bath House. The Armadillo House is one of our cabins, and offers a “Glamping” experience. 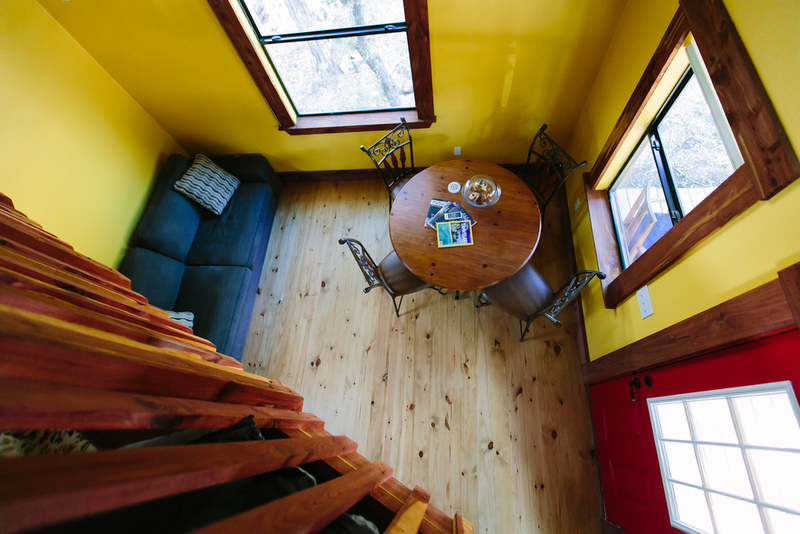 Armadillo House is $135/night ($140 March - May 2019) for 2 guests. For each additional guest, there is a $25/guest per night rate increase up to 4 guests. There is no additional charge for children under 13. Fur babies are welcome but must be kept in a crate if left unsupervised.